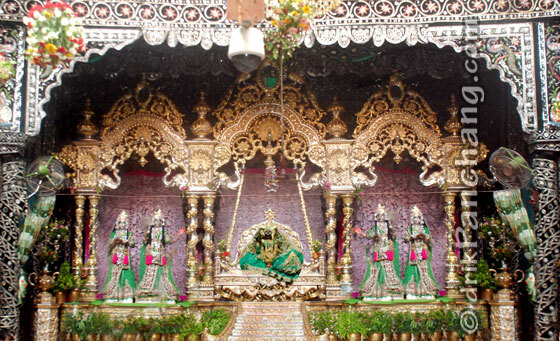 Bihari Ji temple at Vrindavan arranges special Darshan of Lord Krishna on Hariyali Teej. In Bihari Ji temple Hariyali Teej was celebrated on August 9th. On Hariyali Teej Lord Krishna is mounted on golden swing. Golden Swing, which is popularly known as Swarna Hindola, is taken out once in a year during the month of Sawan. Devotees throng to temple on Hariyali Teej to get a glimpse of Banke Bihari on golden swing. Banke Bihari is one of the names of Lord Krishna. Banke means bent at three places and Bihari means supreme enjoyer. In the form of Banke Bihari, Lord Krishna stands in Tribhangi Mudra. Tribhangi Mudra is the most popular pose of Lord Krishna in which He stands with one leg bent in front of the other and raises a flute to His lip in a relaxed pose. 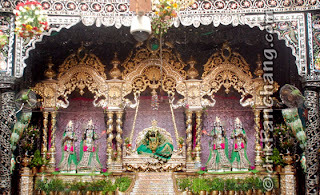 Swarna Hindola Darshan at Dwarkadheesh temple in Mathura is also popular and is arranged on the first day of Sawan. Apart from Swarna Hindola, Phul Hindola Darshan is also quite popular among devotees.